If you love classics as much as we do, you will love Capitello. Capitello can be used for seating or as a stand alone sculpture, indoors our outdoors! This cult classic from 1971 adds a witty accent to any indoor and outdoor space: lounge, terrace, cafe, waiting room. Capitello came to international attention in 1972 with the new york exhibition 'italy : a new domestic landscape' at the MoMa - museum of modern art. Referenced in many books about modern design including the famous Lutopie du tout Plastique (available in our other listings). You are bidding on a factory brand new authorized production by Heller. The "Capitello" side chair is made from a self-skinning polyurethane foam that has been molded into the uppermost architectural element of the Greek Ionic column--the capital. 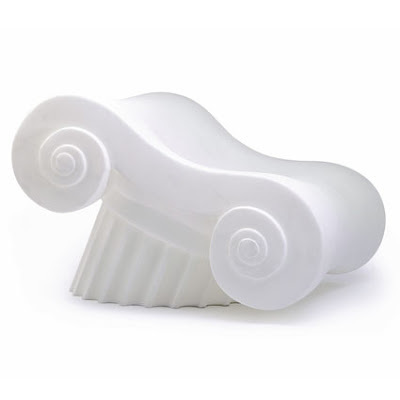 Its ironic humor lies in the fact that this soft, pliable modern material has been shaped as a hard, load-bearing form, and important symbol of ancient Greek architecture. The visual references derived from architecture and art supersede functionalism, as indeed they do in most objects designed by Studio 65 and other antidesign groups of this period, transforming furniture, jewelry, accessories, and even architecture itself into objects of fantasy. In Italy throughout the 1960s and 1970s, radical design groups were established in opposition to the pure functionalism of the International Style. In 1965 Studio 65 was founded by Piero Gatti, Cesare Paolini, and Franco Teodoro, architecture and art students in Turin. Their ironic adaptation of classical elements predates the historicist designs of such 1980s postmodernists as Robert Venturi and Michael Graves in America and Hans Hollein, Ricardo Bofill, and Aldo Rossi in Europe, and it also takes note of pop art developments of the period. Capitello is in the permanent collection of the Metropolitan Museum of Art.